Angry Birds have landed! It is impossible to write an article on Android Games / Apps and not discuss Angry Birds by Rovio. It is probably the most anticipated Android title of the year. 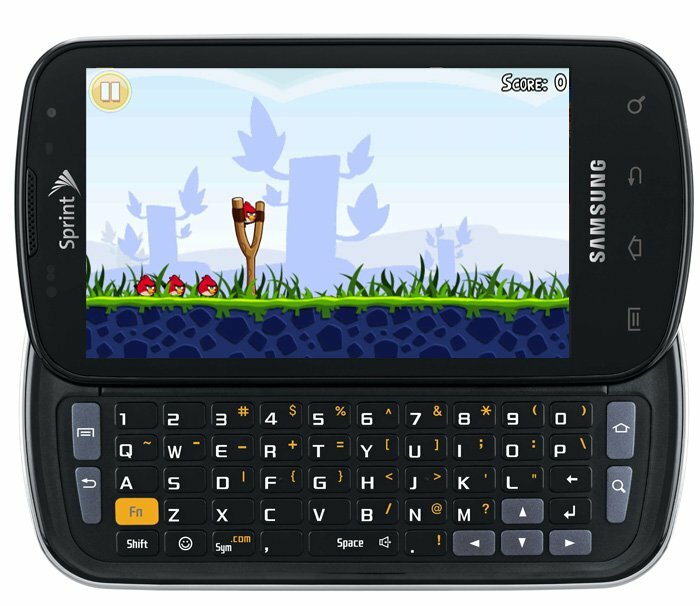 Even though it has already been released on both the iPhone and the Palm WebOS (I know! ), the full Android version of the program broke records and crashed servers last week with 1-million downloads in the day of release. And, Rovio released it FREE (it does contain ads though). That proves the popularity of the Android platform. No wonder Apple is concerned. Basically, Angry Birds is a mix of strategy, action and twisted humor (the Birds are seeking revenge on the Pigs that stole their eggs for breakfast. I wonder if the Birds have a ham lunch by the end of the game.) You must shoot the birds by slingshot at the pigs, destroying various structures along the way. You only get a limited number of birds for each challenge and different birds have different capabilities (super fast, extra strong, mid-air jump, split into multiple bird bombs, etc.) 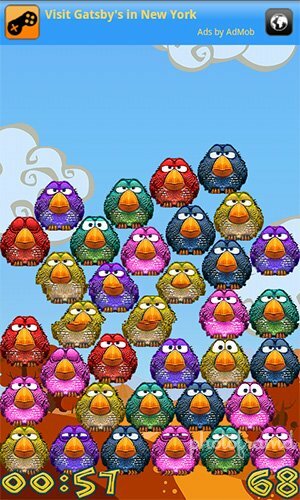 It’s funny, it’s addictive and it’s FREE through the Android Marketplace. 3D games are big on Android 2.1/2.2. When you combine a fast CPU, fast OS and plenty of storage space, you have the perfect platform for 3D games. Sure, there are the ports of classics like Quake and Doom, but Gameloft is focused on creating original 3D games for the mobile platform. Racing, adventure, combat, Gameloft has a title which will please with titles like Asphalt 5, Assassin’s Creed, N.O.V.A, Hero of Sparta and the new Avatar. 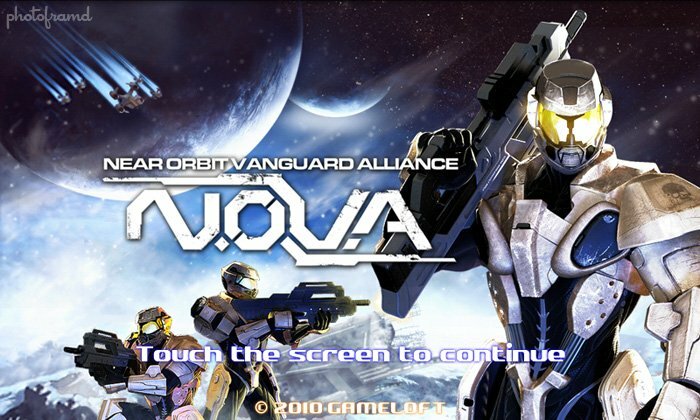 Now, for the controversy – Gameloft will no longer release its newest games to the Android Marketplace. Instead, their website offers a try-then-buy approach where you request a download link and get a TXT to your phone. Unfortunately, their current system does not work. Instead, you can download the Gameloft App from GetJar to get trial versions and later pay for the full game. (You will need to allow installs from unknown sources under Applications to install.) By the way, Gameloft is the mobile software division of the French publisher Ubisoft which has released such titles as Assassin’s Creed games, various Tom Clancy games and Prince of Persia games. Plenty of other games to choose too. 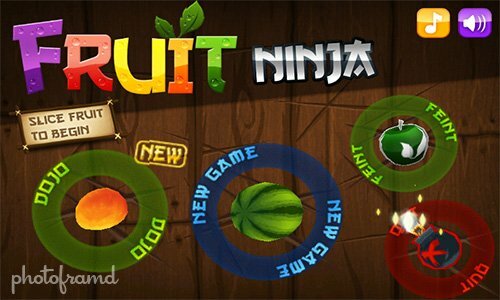 Fruit Ninja by Halfbrick Studios is very simple to play but quickly becomes challenging. A variety of fruit is tossed on the screen and you need to slash it before it falls off the screen. Be sure to avoid the bombs. Available through the Android Marketplace. 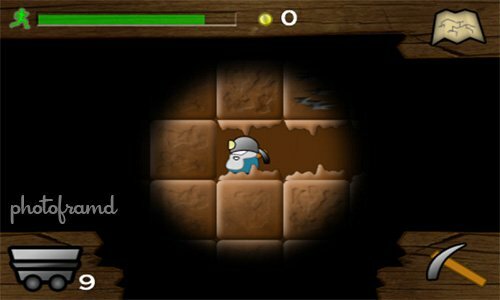 Gem Miner by Psym Mobile is reminiscent of a classic platform game. Explore the large underground mine for ores, metals and gems which can be sold to buy better equipment to dig even deeper. Available through the Android Marketplace. 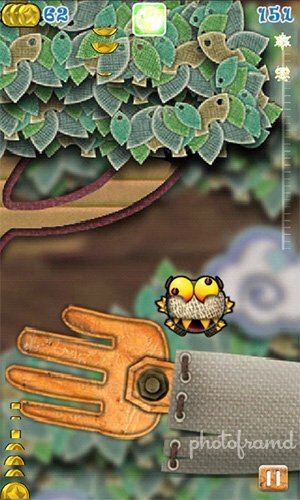 Hyper Jump by Camel Games is gorgeous. Rich graphics and smooth action make this a very enjoyable distraction. Just see how high you can get by picking up coins and bonuses which propel you higher towards the next level. Available through the Android Marketplace. 4 Teh Birds by doubl3vdoubl3a is sort of a bird-version of Bejeweled. The birds are released in a group which can be spun around to match colors with other birds and fly away. One difference with this game – the already placed birds can also be moved and reordered but you will need to deal with the weight of the other birds on top. Available through the Android Marketplace. 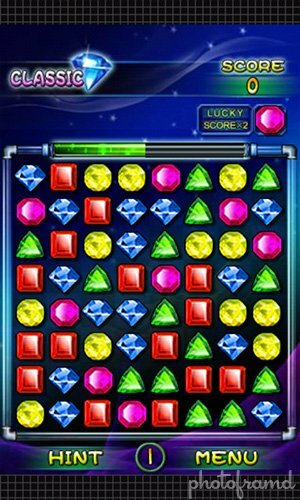 MagicGem by Wuzla is the best “Bejeweled” game currently available. Great graphics, sound effects and game play. Until Astraware releases a real version for Android, this is the perfect alternative. Available through the Android Marketplace. 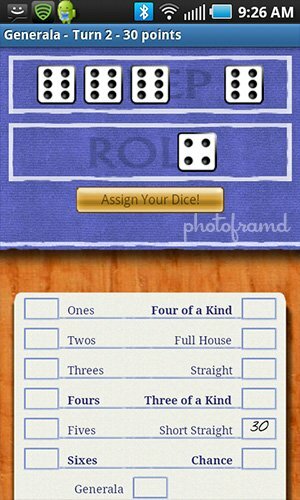 Generala by Kittehface Software is the best Yahtzee/Farkle available on Android. Available through the Android Marketplace. 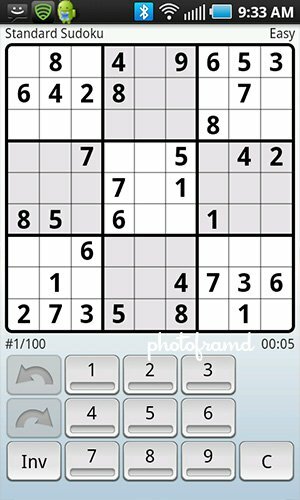 Andoku is an open source version of Sudoku which also includes several popular variations like X-Sudoku and Squiggly Sudoku. And, it’s FREE! If you would rather pay of a version, Astraware did release their popular version of Suduko for $4.99. Both Apps are available through the Android Marketplace. Plenty of other Apps too. 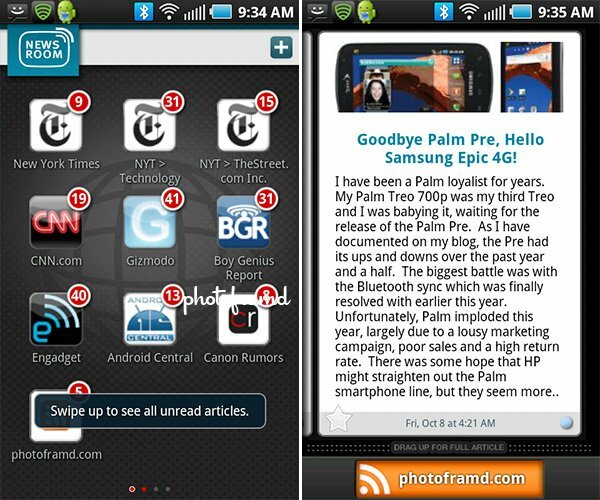 News Room by Trileet was my favorite news feed reader on the Palm Pre. It is now available for Android and is just as good. It has a great selection of popular feeds (including mine!) and you can even manually enter additional feeds. The main screen will alert you to the number of new articles. Click the icon to see a preview of the article. Swipe up to read the full article. Much easier to carry than a newspaper or an iPad! Available through the Android Marketplace. 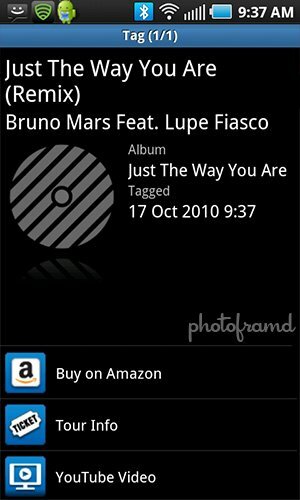 Shazam will listen to a song and try to match it against its ever growing database of over a billion songs. There are two versions of this App available through the Android Marketplace. The Free version is limited to 5 tags per month. The paid version allows for unlimited tagging. 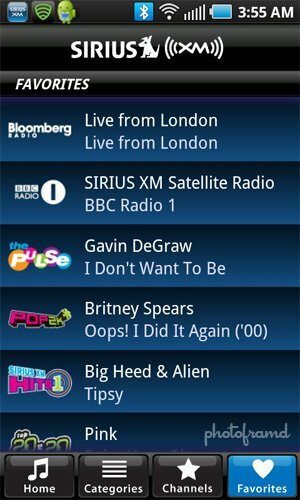 Sirius XM has an add-on subscription for Android and direct web listening for only $2.99 a month. The sound quality is great as long as you have a good data connection. This App is only available direct from Sirius XM, but there is a free trial version also. There are so many more Android Apps available and many are free or free to try. There is Google Goggles for grabbing all sorts of things and comparing it against the Google databases. This App can be used to grab those square QR barcodes to jump to a special URL as well as the standard barcodes for price shopping. Google is looking to expand this App to include all sort of object recognition capabilities. There is also Google Sky Map which lets you scan the heavens for stars, constellations, planets and other objects. Yes, just like the one in the Apple commercial. Thanks for the recommendations! I checked the Android Marketplace and cannot find Super Yahtzee. 4 Teh Birds is absurdly addictive. I just spent an hour flinging little birdies around. They are just so darn cute though! They are! And, it’s so funny when you create a chain reaction of multiple matches. I almost cleared the entire screen in a matter of seconds. It is a very unusual game.